Contel is the exclusive official distributor of Allen-Bradley programmable controllers in Israel. Having worked together since the 70’s, we are proud to supply our customers with Allen-Bradley’s amazingly powerful controllers. In many respects, Allen-Bradley sets the industry standard for controllers, spearheading technological innovation as it continues to provide development tools that greatly reduce the time it takes to develop control applications. Thanks to its renowned user-friendly interface and RSLogix Series development tools, control personnel benefit from extremely easy maintenance of control applications and significantly reduced development times for new applications. A warranty of at least 12 months on every product sold by the Contel warehouse. Extensive on-hand stock of spare parts for most of the controllers, I/O cards, communications adapters and other products that we supply our customers with. We can guarantee the delivery of spare parts to the customer site within four hours, any time of the day or night, thereby helping customers to greatly reduce downtime in the event of a hardware fault. An electronics lab for repairing faulty control components. Planning and implementing the layout of programmable controllers in control cabinets. [Add link to sub-area: control cabinets]. The flagship ControlLogix Series of controllers for high-performance control applications: built-in support capability for hot backups, integration of variable-speed drives built into the controller, support for widely used communications protocols, and a solution for SIL2 applications. The controllers are programmable with RSLogix5000 software – a controller programming tool with a familiar and user-friendly interface. The popular CompactLogix series of controllers for small to medium control applications, yet very powerful. Geared to the level of the machine or product line, with the ability to communicate over widely used protocols. These controllers, like the ControlLogix controllers, are also programmable with RSLogix5000 controller software. The MicroLogix Series of controllers for small applications. This series has five families of controllers with a raft of features suited to most types of simple control applications. Expansion cards can be added to controllers to support additional IO points. The controllers can be programmed using RSLogix500 software. SLC controller series – a series of controllers widely used in Israeli industry. 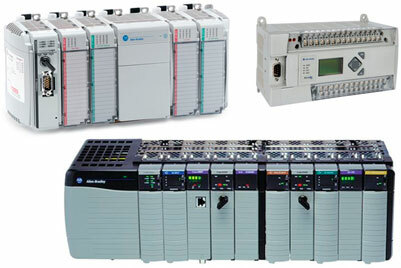 PLC 5 controller series – the veteran and powerful series of controllers. PLC2/ PLC3 controllers series – a series of controllers widely used in the 1980’s in the first plants to install control systems in Israeli industry.